I'm sure many of you enjoy taking photographs as much as I do. My niece and I, cameras around our necks, visited Old Temecula, California last year. We were in the area for my nephew's wedding. Old Temecula is an interesting lively little historic town. The architecture and flowers were beautiful. Of course, we enjoyed the shopping too! 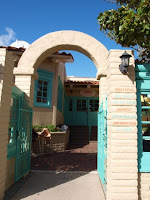 The building shown here is of a Mexican restaurant and I loved the turquoise and cream against the brilliant blue sky. The arches, gates and paned windows added even more interest. 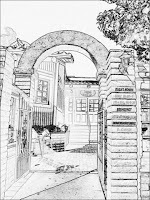 As much as I loved photographing this building, I really enjoyed running the photo through an App called Photo Pal and creating a sketch of my original photo. LOVE THIS! I changed the setting to Sepia, printed it out and adhered it to an 8" x 10" canvas board. 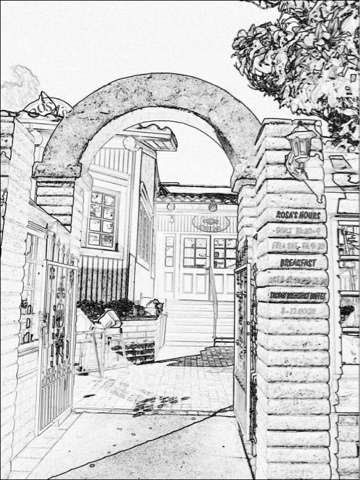 The grayscale version is shown here to the right. 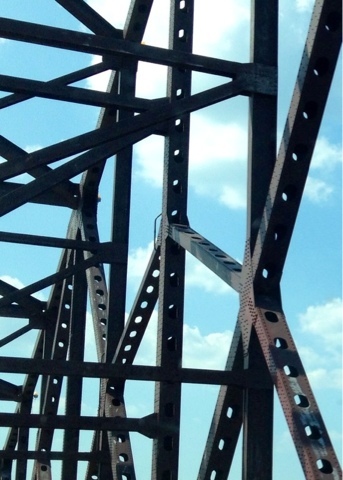 The next photo I used in the App was of a bridge in Chicago (left) - can't remember which bridge. Anyway, I ran it through the Photo Pal app, used the Invert FX and got the cool print on the right. The inverted one is now on a 5 x 7 canvas board. 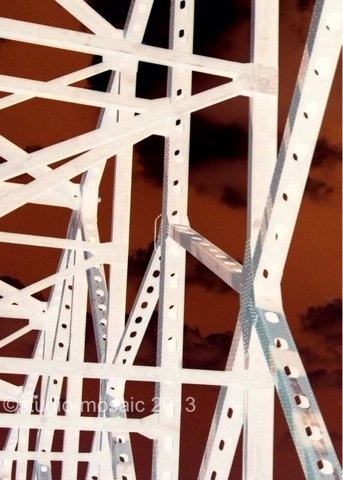 I did another one cropping a different section of the bridge, inverting it, and attaching to a canvas board, so I'd have two of images that weren't exactly the same. There are a lot of great Apps out there.....I am still playing with them...some are free, at least until you pay something to make the ads go away. Some other apps I like are Over, Rhonna Designs, Photo Shaper, PhotoCollage. The opinions I have of these apps are my own...I am not a paid agent of any of the app designers. If you haven't played with any of these Apps, give them a try. If an App has a free version, try it first! There are SOOO many options and I pay attention to the reviews given. Also, you might want to get iWatermark so that you can establish a copyright text line, then apply it to each photo before you put it online. It's a great little App!